UL’s solution for testing and certification of Automated Teller Machines (ATM) offers the best approach for Acquirers, Processors, and ATM Vendors to validate and certify their ATMs connecting to the major payment networks. All payment schemes mandate proper testing and certification before allowing ATMs to be connected to their network infrastructure. The ultimate goal of these tests is to ensure interoperability and to have an EMV-compliant, payment association-certified ATM that can perform trouble-free transactions within your payment infrastructure. The UL Brand Test Tool along with the UL ATM Certification Module, can be used to support you in the test and certification processes of the major payment brands. Using the UL Brand Test Tool with the UL ATM Certification Module you can easily and successfully perform all required card brand testing processes. Using the UL ATM Certification Module can successfully test ATMs equipped with a motorized reader and security shutters. The UL ATM Certification Module runs within the UL Brand Test Tool and uses ATM Test Cards loaded with simulated card images to perform the ATM test cases. The simulated cards also have transaction logging capabilities. Using the UL Brand Test Tool with the optional Host Simulator module, you have even more flexibility in your testing. This module allows you to set the host configuration parameters at your discretion. 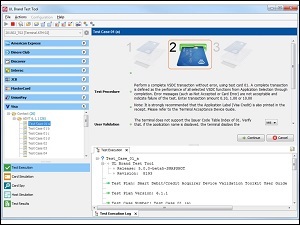 UL Brand Test Tool Host Simulator Module supports protocols such as VisaNet, Mastercard BankNet, APACS 70, ISO 8583, and AS2805. Test contactless ATMs by adding the UL SmartWave Box to your test environment. All contactless ATM test cases required by the payment brands are covered in UL Brand Test Tool. Performance benchmarking on contact ATMs with a dip reader using the UL SmartLink Box or on contactless ATMs using the UL SmartWave Box. Note that the UL ATM Certification Module is an additional module and can only be used in combination with the UL Brand Test Tool or UL Card Simulator.